This photograph was taken in 1882 for the Archaeological Survey of India. 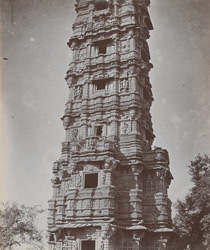 It shows the Jaya Stambha, or Tower of Victory, erected by the warrior king Rana Kumbha (ruled 1433-68) in 1448 to commemorate his victory over the Muslim ruler of Malwa, Mahmud Khalji. It has nine storeys separated by decorative balconies and an internal staircase that now leads to the dome at the summit, a modern addition. Carved relief images of Vishnu and other Hindu divinities cover its exterior surfaces. The fifth storey also has figural images of the architects of the tower. This view shows the lower portion of the tower. Chitorgarh in the modern-day state of Rajasthan was an important Rajput fortress throughout the medieval period. It served as a political capital, despite being sacked by both Ala-u'd-din Khalji in 1303 and Bahadur Shah of Gujarat in 1535, until it was finally taken by the Mughal emperor Akbar in 1567. It was later returned to Rajput control but never regained such prominence again.